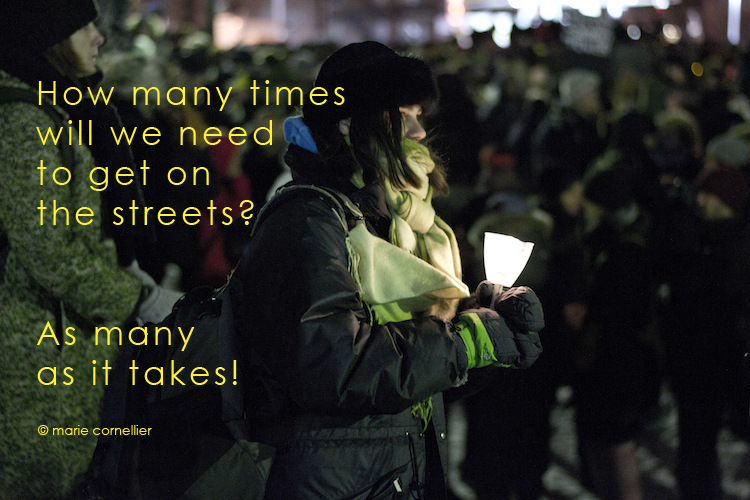 how many times will we need to get on the streets? And if I cannot be there, another sister, mother, daughter, grandmother, friend, will there, to keep our voices loud and clear : Never again*. After the shooting of 6 Muslim men as they attended their mosque in Quebec city last Sunday, January 29, and just a few days after Trump’s Muslim ban, Montreal citizens held a vigil to grieve with the families, oppose violence and tell everyone : No Hate No Fear – Refugees Are Welcome Here. * On Never Again… listen to the statement made by Holocaust women survivors to make sure that we will always remember that less than a lifetime ago 6 million people were murdered just for being Jewish; then we promised “Never Again”.